Israeli forces continued with systematic crimes, in the occupied Palestinian territory (oPt), for the week of 21 – 27 February, 2019. Israeli forces continued to use excessive force against peaceful protestors in the Gaza Strip, and killed a Palestinian child in eastern Gaza City. 117 civilians, including 19 children, eight women, a journalist, and a paramedic, were wounded. The injuries of three were reported serious. In the Gaza Strip, the Israeli forces continued to use lethal force against the participants in the peaceful protests organized along the Gaza Strip borders, which witnessed the peaceful protests for the 48th week along the eastern and northern border area of the Gaza Strip. They also continued to use force as well during the incursions into the West Bank. In the Gaza Strip, Israeli forces killed a Palestinian child and wounded 117 civilians, including 19 children, 8 women, a journalist, and a paramedic, while participating in the Return March. The injury of three of them was reported serious. In the West Bank, 4 civilians, including a child, were wounded by the Israeli forces in different shooting incidents. In the Gaza Strip, in new crime of excessive use of force, on 22 February 2019, Israeli forces killed Yousef al-Dayiah (14), from al-Zaytoun neighborhood, east of Gaza City. Yousef was wounded at approximately 16:50 after being hit with a live bullet to the chest while present 50 meters away from the border fence, east of al-Shuja’aiyia neighborhood. His death was declared at 18:10. In the same context, Israeli forces wounded 117 civilians, including 19 children, 8 women, a journalist, and a paramedic. The injury of three of them was reported serious. As part of targeting the Palestinian fishermen in the sea, the Israeli forces continued to escalate their attacks against the Palestinian fishermen, indicating the on-going Israeli policy to target their livelihoods. During the reporting period, PCHR documented 11 incidents were as follows: 6 incidents in western al-Sodaniyia shore, 4 incidents off al-Waha resort and 1 incident off Khan Yunis shore. As part of targeting the border areas, Israeli forces stationed along the border fence with Israel, east of al-Shawkah village, east of Rafah, opened fire at agricultural lands. On 23 February 2019, =Israeli forces stationed along the border fence with Israel, east of Khan Yunis, opened fire at agricultural lands, east of Khuza’ah village. On 25 February 2019, Israeli forces stationed along the border fence with Israel, opened fire at Palestinian shepherds, east of Dir al-Balah in the center of the Gaza Strip. On 26 February 2019, the Israeli shooting recurred at agricultural lands, east of Dir al-Balah in the center of the Gaza Strip. No casualties and damages to property were reported. In the West Bank, Israeli forces wounded four Palestinian civilians, including a child and a journalist, in different shooting incidents. During the reporting period, Israeli forces conducted at least 81 military incursions into Palestinian communities in the West Bank. During those incursions, Israeli forces arrested at least 55 Palestinians, including 3 children. Moreover, the Israeli forces conducted a wide-scale arrest campaign in occupied East Jerusalem, where they arrested 73 civilians, including a child. Among the arrestees were the governor of Jerusalem, the two leaders Khader ‘Adnan and Tareq Qa’dan, and the two sheikhs ‘Abed al-‘Azim Suhlob and Najeh Bakirat. Moreover, the Israeli forces insulted Palestinian civilians, whose houses were stormed in addition to confiscating their money and vehicles. In the Gaza Strip, on 24 February 2019, Israeli forces moved around 100 meters into the west of the border fence with Israeli, east of al-Buriej Camp in the center of the Gaza Strip. On 26 February 2019, the Israeli forces moved 100 meters into the southeast of Beit Hanoun, north of the Gaza Strip. The Israeli vehicles leveled and combed lands previously leveled. As part of Israeli settlers’ attacks and demolition, on 21 February 2019, Israeli soldiers accompanied with the Israeli Civil Administration Officer uprooted 300 olive seedlings planted 2 years ago from a plot of land belonging to al-Warasnah and al-‘Ayaydah familes in Was Aseer area, east of al-Shayyoukh village, north of Hebron. The soldiers confiscated the seedlings under the pretext that the land belongs to the state lands. On 27 February 2019, Israeli forces moved into Khelet al-Dabi’ village, east of Yatta, south of Hebron. They uprooted 50 olive seedlings planted a year ago from a plot of land belonging to ‘Ali Mohamed Jaber Dababsah. On 21 February 2019, a group of Israeli settlers, from “Talmoun” settlement, punctured the tires of 10 vehicles belonging to the residents of Ras Karkar village, west of Ramallah. They also wrote 2 racist slogans and drew David Star on 2 of the mentioned vehicles. On the same day, a group of Israeli settlers, from “Yatizhar” settlement, attacked ‘Oreef village, south of Nablus from the eastern side. The settlers were under the Israeli forces’ protection. The settlers threw stones at Palestinian civilians, who gathered to confront the setters. As a result, Hamam Anwar ‘Abed al-Hafiz Shehahda (18), was hit with a stone to the right leg, causing rupture in ligaments and fracture in his right leg. On 22 February 2019, a group of Israeli settlers, from “Bani Qadim “ and “ Asfar“ settlement, which is established on Palestinian civilians’ lands, east of al-Shayyoukh village, north of Hebron, uprooted 200 olive seedlings planted 2 years ago in Mares Ras al-Hait area. On 23 February 2019, an Israeli settler attacked Husam ‘Abed al-Raheem Abu Hadeed (48) and punched him while heading to his work in the Hebron Rehabilitation Committee. Northern Gaza City: The Israeli shooting at Palestinian demonstrators resulted in the injury of 29 civilians, including six children and four women. Sixteen of them were hit with live bullets and shrapnel, eight were directly hit with tear gas canisters and five with rubber bullets. The injuries of two of them were reported serious while the others’ injuries were between moderate and minor. Gaza Strip: The Israeli shooting at Palestinian demonstrators resulted in the killing of Yussuf Sa’eed Hussein al-Daya (14), from Zeitoun neighborhood, east Gaza City. At approximately 16:30, Yussuf was hit with a live bullet to the chest while he was around 50 meters away from the border fence, east of Shuja’iyya neighborhood. His death was declared at 18:10. Furthermore, 51 civilians, including seven children and four woman were wounded. Twenty-three of them were hit were hit with live bullets and shrapnel, 25 with were directly hit with tear gas canisters and three with rubber bullets. Central Gaza Strip: The Israeli shooting and throwing tear gas canisters at Palestinian demonstrators, which continued until 17:30, resulted in the injury of 13 civilians. Eight of them were hit with a live bullet and shrapnel and five were directly hit with tear gas canisters. Khan Yunis: The Israeli shooting at Palestinian demonstrators in Khuza’a village resulted in the injury of 22 civilians, including four children and a paramedic. Four of them were hit with live bullets and shrapnel and 18 were directly hit with tear gas canisters. Doctors classified the injury of one of them as serious others’ injuries were between moderate and minor. The wounded paramedic was identified as Fares Hassouna Ahmad al-Qedra (30), who was hit with a tear gas canister to the head, and the wounded journalist was identified as Muneeb Sameer Ahmad Abu Hatab (23), who was hit with a tear gas canister to the chest. Rafah: The Israeli shooting at Palestinian demonstrators resulted in the injury of two civilians with live bullets and shrapnel. Following the Friday prayer, on 22 February 2019, a peaceful demonstration started in front of ‘Ali al-Bakka’ Mosque. Dozens of civilians, from Hebron, along with local and international human rights defenders participated in the demonstration to commemorate the Cave of the Patriarchs massacre “the Ibrahimi Mosque massacre”. This massacre was carried out by an Israeli settler namely Baruch Goldstein against the worshipers at al-Ibrahimi Mosque on 25 February 1994. The demonstrators also called for opening al-Shohadah Street, which was closed since the mentioned date. The demonstration entitled: “Dismantle the Ghetto” and organized by national parties in the city. The participants raised Palestinian flags and banners calling for ending the closure in the center of Hebron and chanted national slogans. They then arrived at the municipality old building near Ossama Ibn al-Monqeth School and gathered, while a large force of Israeli soldiers were in the place. After that, the participants headed to the entrance to the closed al-Shuhada Street, where Shotir (al-Shuhahda) military checkpoint established. They chanted slogans for around 15 minutes in front of the checkpoint before throwing stone at the soldiers. Dozens of Israeli border guard officers fired sound bombs and tear gas canisters at the participants and stone-throwers and chased them on Wad al-Tuffah Street. As a result, many participants suffered tear gas inhalation. In the meantime, the Israeli border guard officers attacked press crews and prevented them from approaching the checkpoint. Moreover, the Israeli border guard officers pushed the participants by hands and threatened a number of them of opening fire at them if they present in the area. The young men continued to throw stones at the Israeli border guard officers, who fired rubber bullets at them. A number of the Israeli border guard officers surrounded the press crews, forced them to retreat and fired sound bombs at them. As a result, Mashhour Hassan al-Wahwah (35), a photojournalist at the Palestine News Agency “Wafa”, sustained shrapnel wound to his left foot. A journalist, Moss’ab Shawer al-Tamimy, said to the PCHR’s fieldworker that the Israeli border guard officers violently attacked the journalists, pushed them and shouted at them. He added that an Israeli border guard officer pointed the rifle at his chest and threatened him of opening fire at him if he would not leave. He added that the journalists were forced to leave after firing a sound bomb, which deliberately fell over them. Following the Friday prayer, dozens of Palestinian civilians and international human rights defenders headed to al-Naqar agricultural area, which is located in the northern side of al-Moghir village, northeast of Ramallah, in order to peacefully protest against Israeli settlers’ attempts to seize and confiscate Palestinians’ lands. When the Palestinian civilians arrived at the area, Israeli soldiers fired live and rubber bullets, tear gas canisters and sound bombs at the demonstrators. As a result, 3 civilians, including a child, were hit with live bullets and taken via a PRCS ambulance to Palestine Medical Complex in Ramallah to receive treatment. 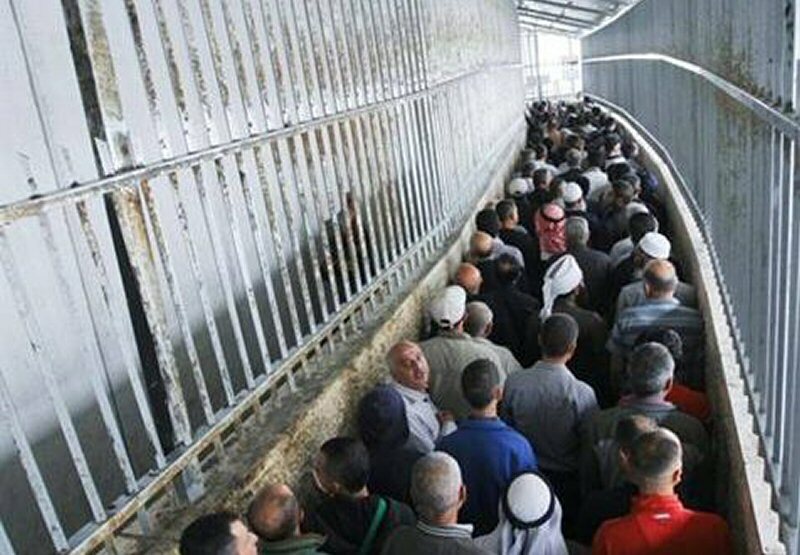 On Thursday, 21 February 2019, Israeli forces arrested 4 Palestinian civilians, from occupied Jerusalem, claiming that they participated in opening al-Rahma Gate. The arrested civilians identified as Fadi al-Motwer, Hijazi Abu Subieh, Jehad Qus, and Murad Misk were then taken to an investigation center in the city. On Friday, 22 February 2019, Israeli forces raided dozens of houses in occupied East Jerusalem and its suburbs. They then arrested 38 civilians and took them to an investigation center. PCHR keeps the names of the arrested civilians. On Saturday, 23 February 2019, Israeli forces raided many houses in occupied East Jerusalem and its suburbs. They then arrested 4 civilians under the pretext of participating in opening al-Rahma Gate, which was closed since 2003 upon a court decision, in al-Aqsa Mosque in the Old City. The arrested civilians were identified as Naser Qus, Head of Palestinian Prisoner’s Club; ‘Ali ‘Ajjaj; Hussni al-Kilani; and Samer al-Qabbani, a guard at the al-Aqsa Mosque. On Sunday, 24 February 2019, Israeli forces arrested Shiekh ‘Abed al-‘Azim Suhlob, Khateeb of al-Aqsa Mosque; and Shiekh Najeh Bakirat; Director of Heritage Foundation at al-Aqsa Mosque. Both of them were arrested under the pretext of participating in opening al-Rahma Gate. The Israeli authorities handed them a decision to deport them from the al-Aqsa Mosque for 7 days. On Tuesday, 26 February 2019, Israeli forces moved into al-‘Izariyia village, east of occupied East Jerusalem. They raided and searched houses, from which they arrested Mahmoud Khakled Damdoum (25) and Ahmed Jawad Othman (14). On Wednesday, 27 February 2019, Israeli forces moved into Silwan village, south of occupied East Jerusalem’s Old City. They raided and searched a house belonging to the governor of Jerusalem ‘Adnan Gaith and arrested them. He was then taken to al-Maskobiyia Police Center in West Jerusalem. On the same day evening, the Israeli forces released him upon the Magistrate Court decision. On Wednesday, Israeli forces moved into al-‘Issawiyia village, northeast of occupied East Jerusalem. They raided and searched dozens of houses, arrested 22 civilians and then took them to investigation centers. PCHR keeps the names of the arrested civilians. On Thursday, 21 February 2019, Israeli soldiers accompanied with the Israeli Civil Administration Officer uprooted 300 olive seedlings planted 2 years ago from a plot of land belonging to al-Warasnah and al-‘Ayaydah familes in Was Aseer area, east of al-Shayyoukh village, north of Hebron. The soldiers confiscated the seedlings under the pretext that the land belongs to the state lands. It should be noted that it was the second time that the Israeli forces and settlers attacked the lands. In February 2019, the Israeli settlers uprooted 400 olive seedlings from the mentioned plot of land. Before their withdrawal, they handed a notice to the family members, who arrived at the area, ordering them to evacuate the land during 45 days and challenge before the competent authorities. At approximately 13:00 on Thursday, Israeli forces accompanied with military vehicles and a vehicle of the Israeli Civil Administration moved into Ethna, west of Hebron, and stationed in the western area. The Israeli Civil Administration officer handed Tayseer Mohamed Tamizah a notice to stop construction work in a 50-sqaure-meter agricultural room built with bricks, under the pretext of non-licensing. A 180- square-meter house built of concrete and belongs to Mohamed Hamdan Hammad Haliyqah (32). A 150-sqaure-meter under-construction house built of concrete and belong to Ahmed Jaber Mohamed Warasnah (28). A 70-sqaure-meter house built of concrete and belongs to Mohamed Ahmed Warasnah (50). At approximately 08:00 on Wednesday, 27 February 2019, Israeli forces moved into Khelet al-Dabi’ village, east of Yatta, south of Hebron. They uprooted 50 olive seedlings planted a year ago from a plot of land belonging to ‘Ali Mohamed Jaber Dababsah. Khelet al-Dabi’ village is located in the east of Yatta village, where 100 persons live. Most of the village’s houses are built with bricks and roofed with tine plates. The Israeli forces handed the village residents notices to stop construction work in addition to demolition notices. The Israeli forces also handed the residents decisions to evacuate their lands under the pretext of being state lands. Hamidan Mohamed Mahmoud Dar Sa’d. At approximately 13:30 on Thursday, a group of Israeli settlers, from “Yatizhar” settlement, attacked ‘Oreef village, south of Nablus from the eastern side. The settlers were under the Israeli forces’ protection. The settlers threw stones at Palestinian civilians, who gathered to confront the setters. As a result, Hamam Anwar ‘Abed al-Hafiz Shehahda (18), was hit with a stone to the right leg, causing rupture in ligaments and fracture in his right leg. He was then taken to Rafidia Hospital in Nablus.